Lentinula edodes mycelia solid culture extract (MSCE) is used as a medical food ingredient and provides beneficial effects to patients with cancer and chronic type C hepatitis. 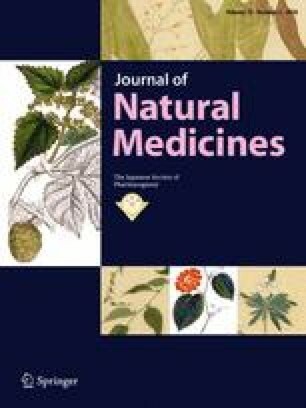 Low molecular weight lignin (LM-lignin), which is an active component of MSCE, exhibits hepatoprotective, antitumor, antiviral, and immunomodulatory effects. In this study, we investigated the effect of LM-lignin/lignosulfonic acid on intestinal barrier function. Lignosulfonic acid enhanced transepithelial membrane electrical resistance in human intestinal Caco-2 cell monolayers. In Caco-2 cells treated with lignosulfonic acid, expression of claudin-2, which forms high conductive cation pores in tight junctions (TJs), was decreased. Lignosulfonic acid also attenuated the barrier dysfunction that is caused by tumor necrosis factor (TNF)-α and interferon (IFN)-γ in Caco-2 cells. TNF-α- and IFN-γ-induced activation of NF-κB, such as translocation of NF-κB p65 into the nucleus and induction of gene expression, was inhibited by lignosulfonic acid treatment. Furthermore, lignosulfonic acid decreased the TNF-α- and IFN-γ-induced increase in interleukin (IL)-1β and IL-6 expression in Caco-2 cells. These results suggest that lignosulfonic acid not only enhances TJ barrier function but also restores TJ barrier integrity impaired by inflammatory cytokines. Therefore, lignosulfonic acid may be beneficial for the treatment of inflammation-induced intestinal barrier dysfunction observed in inflammatory bowel disease. Koji Matsuhisa and Akihiro Watari contributed equally to this study. The online version of this article ( https://doi.org/10.1007/s11418-017-1167-5) contains supplementary material, which is available to authorized users. We thank Ms. Shizuka Yamagishi for technical assistance. This work was supported by JSPS KAKENHI Grant Nos. 26860078 and 16K08370; by the Suzuken Memorial Foundation; by the Mishima Kaiun Memorial Foundation; by the Yokoyama Rinsho Yakuri Foundation; and by the Basic Science and Platform Technology Program for innovative Biological Medicine from AMED.